The Turkish government claims to have seen off an attempted military coup that began on Friday afternoon as President Erdogan was on holiday in the south of the country. AFP News agency reports comments by the Turkish Prime Minister that the total dead in the coup bid are 161, with 3,000 now taken prisoner. 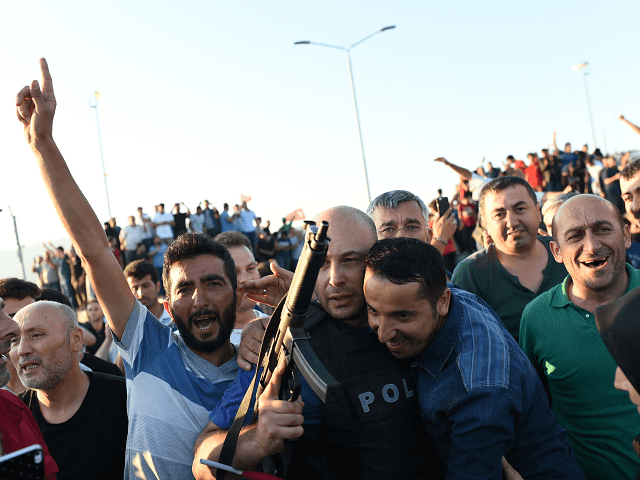 Despite claims that the situation is totally under control by the turkish government, it is thought coup plotters are still offering resistance in some areas. Those who escaped Turkey to neighbouring Greece have been identified by Athens News Agency and reportd by AFP as three majors, three captains and two sergeant majors. Turkey’s Foreign Minister Mevlut Cavusoglu said Ankara had asked Athens to send back the eight. “We have requested Greece to extradite the eight traitors as soon possible,” Cavusoglu was quoted as telling HaberTurk television. According to an official in the Greek National Defence General Staff, “the helicopter is scheduled to be sent back immediately to Turkey”. “As far as the asylum seekers are concerned, we are going to proceed according to the international law” Olga Gerovassili, the Greek government spokeswoman, said. She said Athens was “in constant contact with the Turkish authorities”, and would take into account the fact that “the asylum seekers took part in a coup against the Turkish constitution”. Greek Prime Minister Alexis Tsipras early Saturday expressed his “support for the democratically elected” Turkish government. 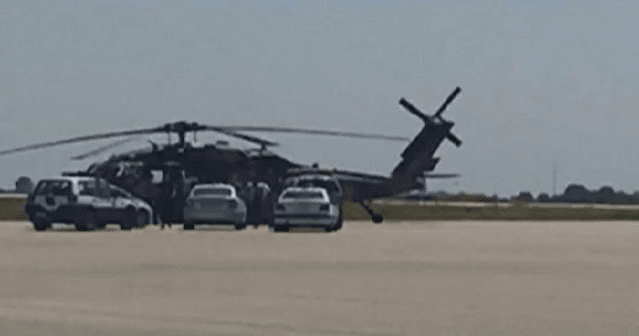 According to reports in Greek media, a Turkish military helicopter has landed at Alexandroupolis airport. GreeceReporter states the aircraft was escorted by two Greek airforce fighter jets and requested permission to land, claiming it was suffering from mechanical failure. Once on the ground it was found to be carrying seven Turkish army officers and one civilian involved with the failed overnight coup, who subsequently claimed asylum in Greece. GreeceReporter states their arrival causes a huge “headache” for the Greek government given the determination of their significantly larger and more militarily powerful neighbour Turkey to severely punish the coup plotters. The website also reported unconfirmed reports that some coup plotters had already been beheaded. 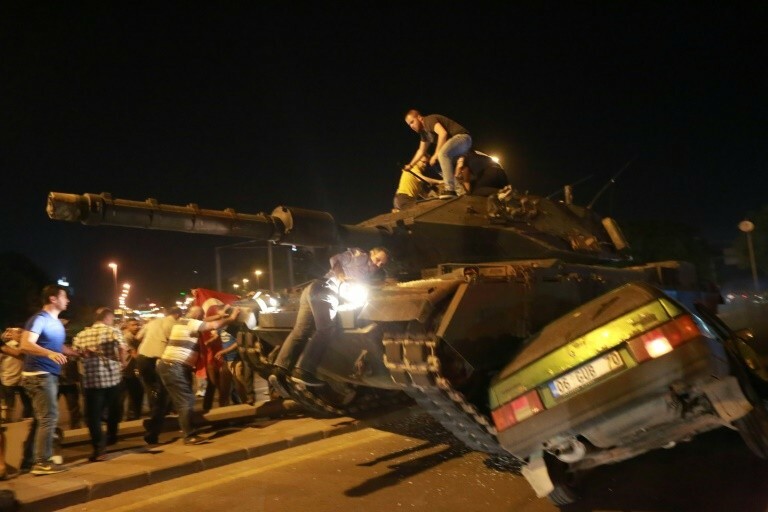 ISTANBUL/ANKARA, July 16 (Reuters) – Forces loyal to the Turkish government fought on Saturday to crush the remnants of a military coup attempt which crumbled after crowds answered President Tayyip Erdogan’s call to take to the streets and dozens of rebels abandoned their tanks. Ninety people were killed, including many civilians after a faction of the armed forces tried to seize power using tanks and attack helicopters. Some strafed the headquarters of Turkish intelligence and parliament in the capital, Ankara, and others seized a major bridge in Istanbul. Erdogan appeared to accuse the coup plotters of trying to kill him and said he would purge the armed forces, which in the past have staged a number of successful coups, although not for more than 30 years. “They will pay a heavy price for this,” he said. “This uprising is a gift from God to us because this will be a reason to cleanse our army.” Later, the presidency warned on Twitter that another uprising could be staged at any time. 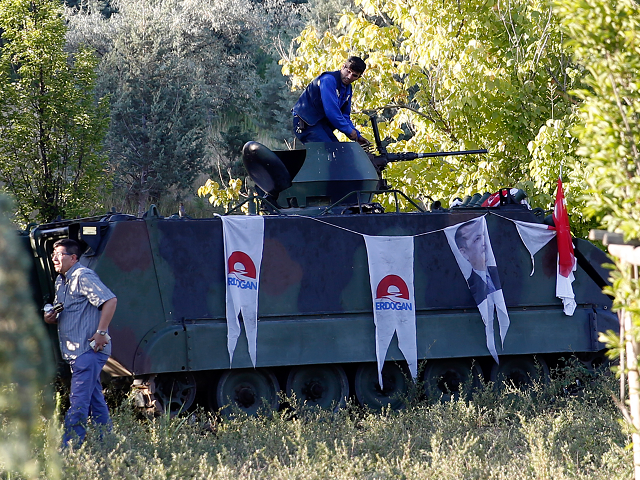 Turkish authorities have already detained about 1,500 members of the armed forces, officials said. The chief of staff, who had been reported held hostage by the rebels, has been rescued, a senior official said. Erdogan, whose Islamist-rooted ideology lies at odds with supporters of modern Turkey’s secular principles, said the plotters had tried to attack him in the resort town of Marmaris. The acting armed forces chief of staff, Umit Dundar, reported heavy casualties. Among the 90 dead were 47 civilians while a further 1,154 people had been wounded. In a live statement broadcast on CNN Turk, Dundar said many military commanders have been taken hostage by the rebels but he declared that Turkey has “closed the chapter” on coups for good. Erdogan’s AK Party, with roots in Islamism, has long had a strained relationship with the military and nationalists. The armed forces have had a history of mounting coups to defend secularism, but have not seized power directly since 1980. Operations involving police special forces and the military were still underway to regain control of the armed forces headquarters in Ankara, one official said. President Erdogan is clawing back control in Turkey after the attempted military coup appears to have failed. Agence France Presse reports over 100 revolutionary soldiers were killed overnight, and more than 1,500 soldiers have been arrested. Although Erdogan has been able to enter Istanbul fighting has not yet ceased as rebels still hold the army headquarters and according to claims by the new cheif of staff appointed by Erdogan last night, they are holding senior generals hostage. BREAKING: Anadolu Agency: Military helicopter used by coup plotters shot down in outskirts of Ankara. Turkish President Recep Erdogan addresses crowd in Istanbul: "The government is not leaving the state. We will be prepared to die." A sr us official told me looks like turkey coup attempt over, erdogan won. BREAKING: NTV television quotes prosecutor's office in Ankara saying at least 42 people have been killed in 'attacks' in the capital. Five other famous coups in history. 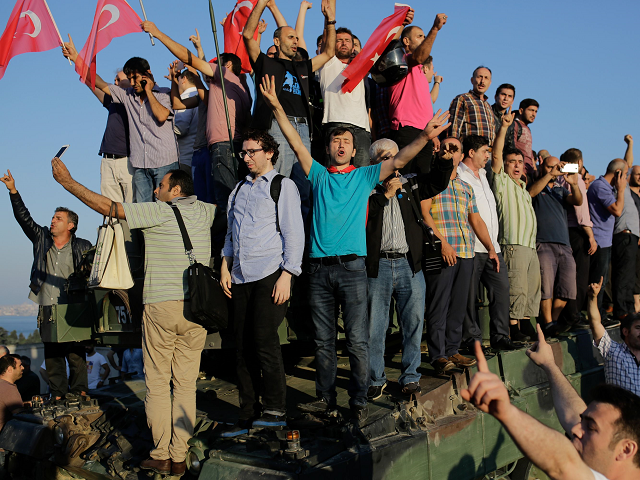 Many commentators describe the coup attempt as "staged" after Erdogan calls it a "gift from Allah."
. @jonkarl: Situation in #Turkey has taken White House officials “completely by surprise." 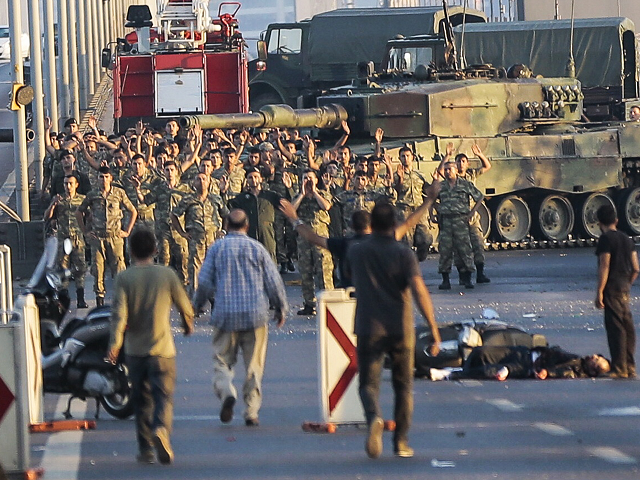 ISTANBUL — The prime minister of Turkey said on Friday night that factions of the military had attempted a coup. 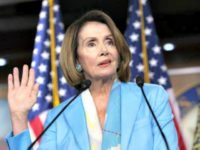 There were sharply conflicting statements about who was in control of the country, a NATO member and important United States ally, which has been convulsed by military takeovers at least three times over the past half-century. Shortly after Mr. Yildirim spoke, the Turkish military issued a statement, according to the news agency DHA, claiming it had taken control of the country. The state-run Anadolu News Agency said hostages had been taken at military headquarters in Ankara, the capital, including the chief of staff. After reports of heavy gunfire near the presidential palace, AFP is reporting that a “strong explosion” has been heard in Ankara. The U.S. Embassy in Turkey confirmed the gunfire in Anakra. Eyewitnesses report some of the gunfire came from military helicopters. The coup appears to have a name, the “Turkish Peace Council.” Turkey’s Justice Minister has claimed the coup is led by followers of Erdogan’s nemesis, U.S.-based imam Fethullah Gulen. President Erdogan resorted to using Skype and Facebook to address the people of Turkey, telling them to leave their homes, flood the airport, and remain outside in defiance of the military curfew. The coup is acting like they have this whole thing just about wrapped up, while the Erdogan government behaves as if it remains in power. European Union observers are reporting that military forces have taken control of airports and strategic points across Istanbul. 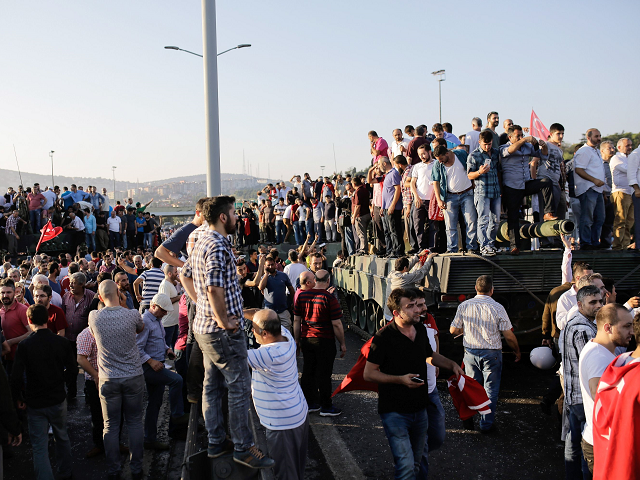 The Telegraph reports that President Erdogan has given a statement, in which he described the coup as “an uprising attempt by a minority within the military,” and spoke of a “parallel structure” within the Turkish government. Erdogan reportedly attempted to fly back to Turkey, but was refused landing clearance in Istanbul, and is now seeking asylum in Germany. U.S. military forces at Turkish airbases, including the main base at Incirlik, have been ordered to “Force Protection Condition Delta,” their highest alert level. A broadcast on state TRT television has declared that “Erdogan’s rule has come to an end.” The military has imposed martial law, and is reportedly already at work on a new constitution. All flights from Istanbul’s Ataturk airport have reportedly been canceled. According to the UK Telegraph, troops have been seen at the headquarters of the state television channel, TRT, in Ankara. The UK Guardian cites “numerous reports that hostages have been taken in the Turkish capital, Ankara,” among them the chief of military staff. President Recep Tayyip Erdogan is not among the hostages; he’s on vacation, and is not in Turkey at the moment. The UK Telegraph reports that while Prime Minister Binali Yildirim urged the public to remain calm, and said “it would be wrong to call it a coup,” he conceded that “part of the military” was making an “illegal attempt” to seize power. BREAKING: Military jets flying over Turkish capital Ankara; military vehicles blocking bridges in Istanbul, reports say. Social media services Facebook, Twitter, and YouTube were reportedly blocked shortly before 11:00 PM local time.